Judith has her studio in the cools hills overlooking the city of Kingston. Throughout her extensive career the two firm poles of her work- painting and printmaking- have been bridged by wide and varied explorations of ideas as well as material. All are subjected to the elemental processes of building- up, or taking- way (reductions). By gouging, collaging, texturing and manipulating surfaces such wood, fabric, wax, paper, she has created her unique visual language. “ … In Judith Salmon’s prints we perceived a genuine concern for the working- class, calling to mind Kathe Kollwitz’s graphics.” (Andrew Hope, the Daily Gleaner 1984). In the mid-80’s Judith continued honing her printmaking skills by studying at the Robert Blackburn Printmaking Workshop in New York City, where she explored several methodologies, finding her strength in the relief print. 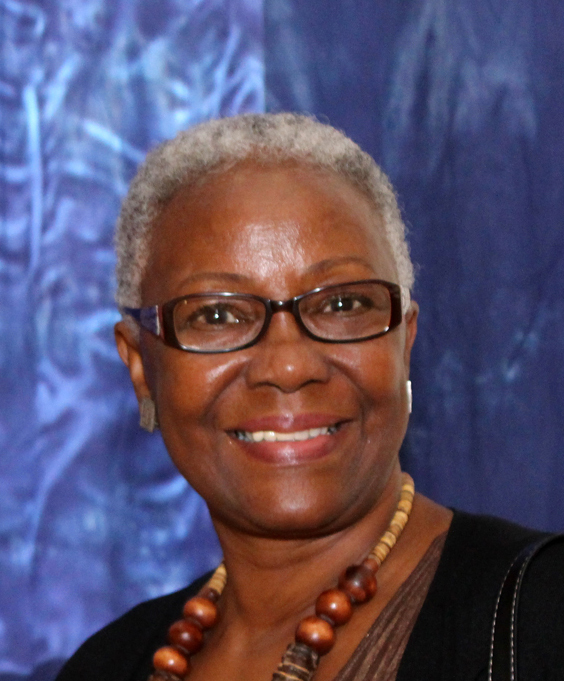 She received the Centenary Purchase Award from the National Gallery of Jamaica, 1987, for her print series on the life of National Hero, Honorable Marcus Garvey. In 1995 her iconic, “Unmasking the goddess”, was exhibited by the National Museum of Women in the Arts, at the Tenth United Nations Decade for Women, Beijing, China. Judith has exhibited in the regional San Juan Biennale of Graphics from the Caribbean and Latin America; she also participated in various fora on printmaking including the Colloquium on Block Prints - Graphic Studio, University of South Florida. She lectured in Printmaking at Edna Manley College of the Visual and Performing Arts, and presented on the topic of Printmaking at the Rex Nettleford Arts Conference, 2017. Judith has a BA Liberal Arts, Norwich University, Vermont; an MFA, Studio Art, Johnson State College, Vermont and a Graduate Certificate in Museum Studies, University of South Florida.